The intricate flowers and leaves decorating a well-crafted latte can transform your morning cup into a special event. 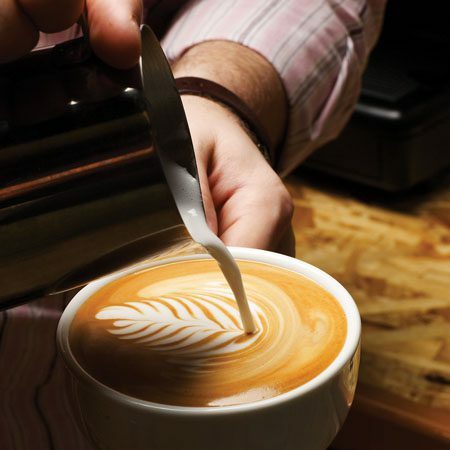 Matt Milletto, coffee consultant and trainer at the American Barista & Coffee School and an award-winning latte artist, shares his insider tips for drinkable designs. Don’t get discouraged if you don’t achieve a perfect rosetta on the first try—like painting, latte art takes practice. “If you’re doing everything right with your espresso and milk, it will come naturally over time,” Milletto assures. This greater attention to process will also improve your drink’s taste and texture. Pull a shot of espresso directly into your cup. Fill a cold steel pitcher about one-third to one-half full of cold milk. Raise the pitcher so the espresso machine’s steam wand is submerged beneath the surface of the milk. Position the wand to one side of the pitcher while keeping the pitcher level. Turn the steam wand on full-blast and lower the pitcher until you break the surface of the milk and hear a hissing sound. This will induce enough air into the milk to develop a velvety texture. Once the pitcher becomes warm (100+ degrees F), raise it up and maintain a rolling motion in the milk. This will cause any larger bubbles to fold into the milk and create a consistent texture of milk and foam. Turn off the steam wand when the milk temperature reaches 140–150 degrees. If using a thermometer, shut off the steam earlier as the thermometer will read roughly 5–10 degrees cooler. Give the pitcher a few taps on the counter to pop any remaining bubbles on the surface of the milk. To keep the milk constituted, swirl it like you would aerate a glass of wine. Pour the milk directly into your cup of espresso. Sink the milk below the surface of the crema by pouring with the pitcher raised above the cup a few inches. When the cup is about two-thirds full, lower the pitcher closer to the crema and speed up the flow of pour—this will encourage a white dot to form on top of the crema. Gently but quickly, move the pitcher from side to side in a zigzag motion, starting at the white dot and gradually moving toward the edge of the cup. You’ll create lines of white milk to contrast with the dark crema. Raise the pitcher slightly and pour straight through the pattern, finishing the pour on the opposite side of the cup. This will feather the design. We feature a number of these tastemakers in our inaugural “Imbibe 75” January/February 2013 issue, but wanted to know more about what makes them tick.